Every August out of habit more than anything else, I plunked it down on my countertop and begged parents for donations to fill it up. My students get to visit the treasure box if they win Behavior Bingo. Over the years I started to resent the time it took them to dig through the box and find what they wanted. And I really started to resent how much space that treasure box took up in my small classroom. What will I use instead? Every teacher living in the real world knows that you need something. Some tangible reward. We all want our kids to have that intrinsic motivation to behave and stay on task but let's face it - some 7 year olds have NOT mastered that behavior just yet. So, while I certainly encourage it in my kids and praise it when I see it, I also know I need something else that makes it more real for them. So what will get them excited instead of dollar store trinkets? Coupons! I started to add them to the treasure box a few years ago and over time they became the most sought after item in there anyway, which leads me to ask myself why the heck I waited so long to actually ditch the box they were in! Read more about my coupons and download some freebies by clicking on the picture below. I know some other bloggers and sellers can help you out here as well. Check out Mel D's great post here. I'm still tossing around ideas for an organizational system and I'll be sure to update you when I do. What will I do with all the stuff in there already? To me, it was junk. Plastic rings, pencils, little bottles of bubbles, rubber balls and bracelets... standard treasure box stuff. But there's a reason it's called a treasure box, right? That junky stuff to me is a kid's delight. So, I gave it to the kids! When cleaning out my closet, I found a whole giant bag of stuff for the box that I had never added, so I took all that loot plus what was in the box already and I divided it all up between 18 brown lunch sacks and started filling them up! There were a few items that I had 18 of (pencils, sidewalk chalk, rings, balls I had collected at a conference) and each bag got one. Then I just filled the rest of the bag with random things. Some were definitely girly (princess pencils, pink peace sign necklaces) some definitely boyish (Spiderman pencils, superhero tattoos) Not that a girl couldn't like those and vice-versa, but you know what I mean... No worries. I had a plan. I stapled the bags shut and we were ready to go. 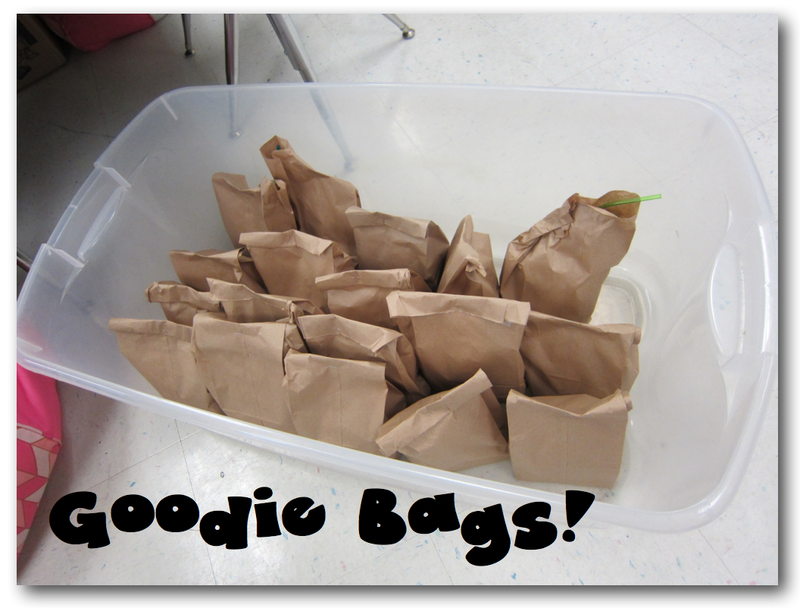 I used Random.org to choose numbers from 1-18 and when their number was up, they got to pick a bag. When everyone had a bag it was time to open. They seemed to dig it! 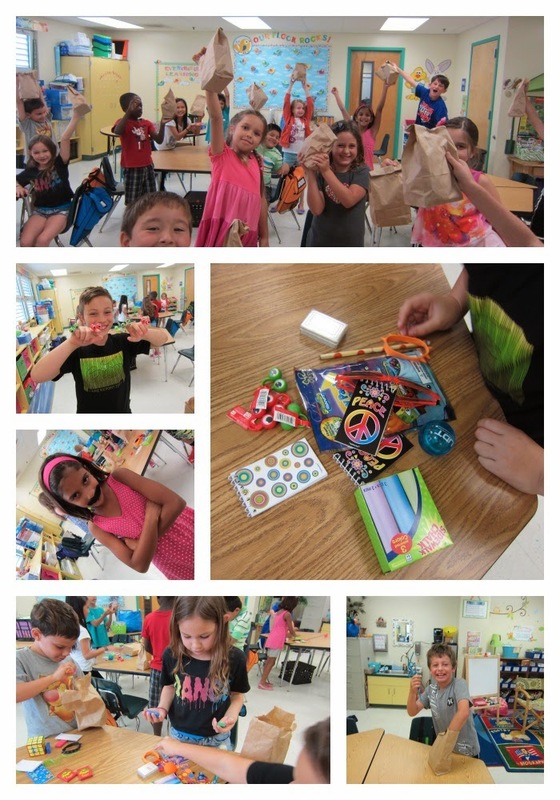 Then I told them if they didn't love everything in their bag, they had some options. They could trade 2 things with someone else and they could give 2 things away without getting anything back. They spent a good half hour checking out the goods and trading. It was a pretty fun experience, especially for the kids who felt like they didn't get to visit the treasure box often enough. What will I do with the box? That one was easy. I gave it to a newer teacher who I knew would put it to good use. You know the saying, one man's trash is another man's treasure? That's one of the truest statements ever in the halls of an elementary school! So, what do you think? Anyone else out there trash the treasure box? I'd love to hear your thoughts! I switched over to coupons from a treasure box last year and have never looked back! I love it -- so easy and no expense. The kids love to bring a stuffed toy or take their shoes off. I have some coupons on my store too. I don't have a treasure box either. 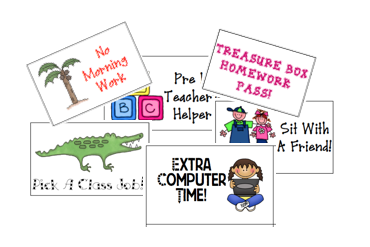 I use the Super Improver Wall, it is part of the classroom management system, Whole Brain Teaching (WBT). It has 10 levels and they need 10 stars to move to the next level. They get so darn excited to earn a star and especially when they move to the next level. For some of them it turns into a bit of a competition of who can be better...not too bad of a problem. I've been thinking about doing the same thing next year! This was just the push I needed to do it! Thanks! Hi Rachel! I've been thinking about it for a while too. I think it's going to make life a lot easier! I have used coupons for several years and LOVE it! It's much more meaningful to be able to do something extra fun or have a bonus like no homework, computer time, or having a quiet lunch in my classroom with a friend (that is a hot ticket item!). One thing that has really worked for me is color coding my tickets - mounting each type on different colored cardstock, laminating them for durability, and storing them all in a mini basket from the dollar store. It is easy to find a certain kind of coupon and I can also pull out some coupons (usually private lunch) if the winter weather and indoor recess is wearing on my sanity. Have a great summer of relaxing and recharging! Ooohh, color coding the coupons is such a great idea!! I will definitely be doing that. Thanks so much for sharing that idea! I use an actual coupon organizer to hold mine and the kids really like "shopping" around for what they want. The most popular one in my room is most definitely the Class Dance Party coupon. They beg each other to buy that one! Haha. Enjoy your new treasure-box-free life! Class Dance Party - that's all kinds of awesome! My kids this year would have LOVED that! So funny! I've been thinking the same thing! Some of the stuff in my treasure box has been there for YEARS!! I've been using coupons. Things like "Sit with a friend" "Use a special chair" "Chew gum" "Wear a hat to school"....I have tons more! The kids LOVE them! Best part...they're free and don't take up space!! I think some of that stuff in my treasure box had to be 10 years old. Some ancient McDonald's Happy Meal Toys, crap from conferences, just total junk! I feel free!!! lol! 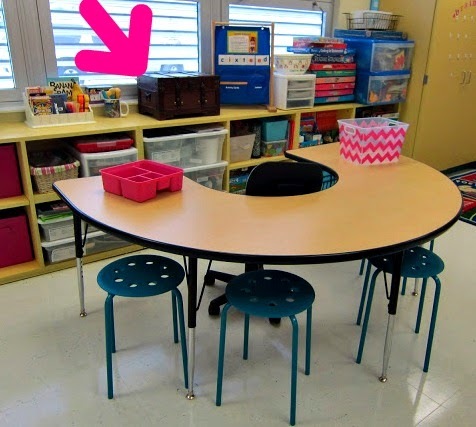 I wanted to ditch the treasure box for my kids...but my co teacher insisted we needed it. Since we were a private school, she decided it was best if we bought everything. [And it wasn't cheap either!] Now that I am relocating somewhere else, I will be using the coupon method instead of giving children toys. I love that they are free and also small little incentives that still make the kids work to be their best! Wow Emily, that's tough when you have to do something you really don't want to. I'm glad you get to do your own thing this year! I have a prize barrel and have grown to hate it. This has inspired me to switch to coupons for September's new school year! I will be checking out your coupons and suggestions. Thank you! I do love a good change! Oh boy - digging through a barrel sounds worse than digging through the box! lol! 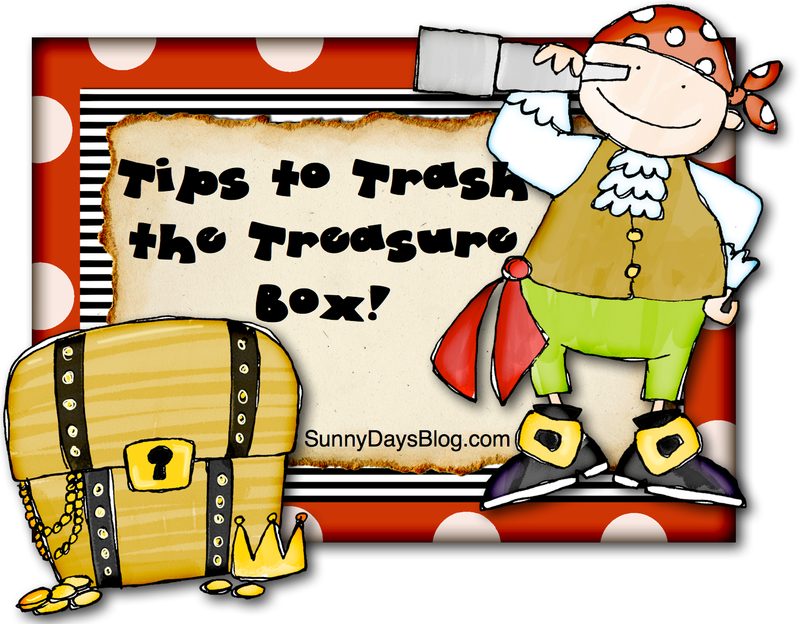 I definitely think the kids will love the coupons and won't even miss the treasure box! I just wanted to say that I used the coupons in Kindergarten and loved them! They are a treasure themselves! And as a relatively new teacher, I take all the trash that more experienced teachers get rid of. So far that has gotten us a hamster and a goldfish and so many resources! One day I will be passing these treasures on to someone else, I know it! I love being able to give newer teachers things I don't need or want anymore. When I was new I took whatever anybody was getting rid of so I know how awesome it feels to get classroom stuff for free!! And yes, before you know it, it will be you helping out a new teacher. It's kind of scary how fast that happens! We've gone back and forth with the whole "prize box" for years now. We have 5 of our own little friends at our homes, so filling up our class box with their old "treasures" has never been an issue. Yes it would be lovely if all littles were intrinsically motivated but that is soooo not the case is it??!!! Hi Denise! The treasure that I want to talk about is your School Stuff board on Pinterest. I love it!!! I started following you on Pinterest as a result of your carpet giveaway. I may NEVER get off of Pinterest now! I started in 2nd grade two years ago (from middle school). I knew at the start that I did NOT want another thing to monitor, so I did not have a treasure box. I have a classroom "bead" system. I have two identical jars. The 100 beads (1" wood beads I painted in my room colors) start in one jar and when they are earned, they are transferred to the other. When it is full, the class gets a movie party. They may know it is coming, but I always surprise them (to keep them on their toes). Then we try to beat the number of days it took to earn it for the next one. The desk fairy visits from time to time, and the class earns beads for random things in addition to great behavior (all tails tucked in - backpack tails hanging out of lockers, all completed homework, good work habits during a specific task, etc). This has worked well for me. I also will reward with extra recess, early snack, sit with a friend, take shoes off, read on the floor/under your desk, etc without beads. With 30 students, I just can't manage an individual reward system. I know I'd forget someone! I love this idea! I think I'll try it next year! I trashed my treasure box this year too. Instead I use a "star chart" similar to the post above me about beads. When the start chart is full, we decide on a party together. I love that it's a whole class effort. I also use PBIS tickets ( a school initiative) which they exchange for prizes from the school (so basically just a treasure box that I don't have to manage and provide). I also use small stickers and pretzels/goldfish/cookie crisp cereal for an instantaneous reward when those others aren't enough. Hi Denise! I just finished my latest TPT product, Busy Bee Behavior Management. Last year when I developed it, I had such an internal conflict about intrinsic vs. extrinsic behavior. I think that my solution blends both nicely. Take a look at it if you get a chance; I'd love to hear your feedback!